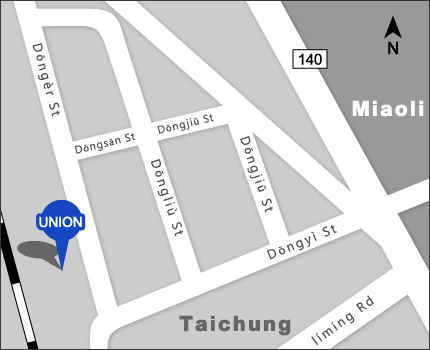 Union Headquarters：No.7 Tun 2 St. Yu-Shia Tachia, Taichung Hsien 437,Taiwan R.O.C. Union Branch：No.33, Gong 1st Rd., Yu-Shia Tachia, Taichung Hsien 437,Taiwan R.O.C. 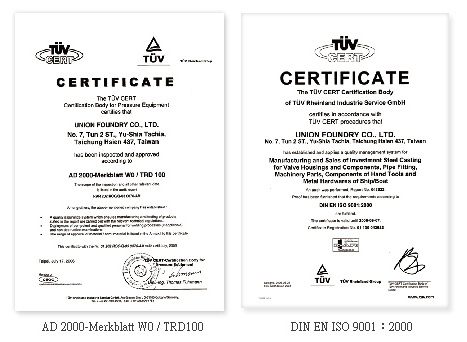 Precision casting of stainless, carbon and alloy steel. Precision mechanical parts, vehicular parts, bicycle parts, valves, pipe and tube, general and marine hardware, hand and aero tools, medical parts, architectural parts ,etc. High-frequency smelting furnace, wax injection machines, case mold making system, sand blasting machine, spectrometer, material test equipment, hardness testing equipment. No.7 Tun 2 St. Yu-Shia Tachia, Taichung Hsien 437,Taiwan R.O.C.